I’m reporting on the 30th of November for our Berg Adventures team, Martin, Woodie and I. We are still at the same camp and the weather has gotten better in terms of temperature. It was much, much warmer this morning but today we have almost no visibility here at our camp. I just talked to Margot on the radio and she tells me that she has 30 knot winds gusting 40 knots down at Vinson Base. That is a strong wind, this time from out of the south and she has very poor visibility in those strong winds. So I think we’ll stay here again today, Martin, Woodie and I. Life is good, don’t worry. I told you when we came up here that we’d be off this mountain in 5 or 6 days in the best conditions. I have to say in terms of weather it has not been the best conditions but we are just fine. 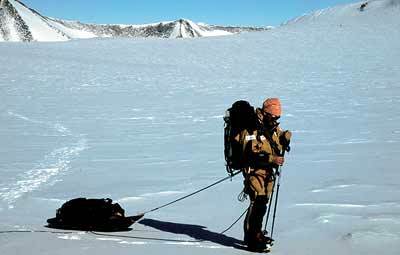 That is why we pull those big sleds behind our backpacks up here so we have plenty of food and provisions. One provision that Martin especially likes are the heat packs that his sister Margaret told him to bring when he visited her in New Jersey not long before he came. Margaret’s heat packs that Martin brought along have come in really handy. Martin is always smiling in his sleeping bag with those things down on his feet. We are drinking a lot of hot drinks, still frying up a lot of sausage in our warmer temperatures and things are going well here at Camp 1 for Berg Adventures on Mount Vinson.